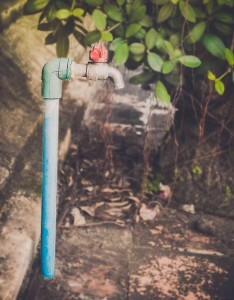 Time to get your outdoor faucet ready for the spring by making these plumbing checks. Spring is on the horizon, which means it’s time to start thinking about doing some maintenance on your plumbing system and fixtures. The warmer weather of the spring will require a different approach to your plumbing than the colder winter. Performing some basic maintenance on your system will keep your plumbing system in great shape and save you from more costly repair work later on. Here are our top 5 tasks you should do to get your plumbing ready for spring. Both your indoor and outdoor faucets should be tested to ensure they are in working order. Your outdoor faucets will probably put out some air when you first turn them on, but this is normal if you turned the water off during the winter. For your indoor faucets, check the hot and cold water separately. This is crucial especially during this period of the year when the temperature fluctuations can be dramatic. These fluctuations can compromise the integrity of your piping system and lead to rupture or leakage. Inspect your pipes and familiarize yourself with your shutoff valves. If you notice any problems, call a professional plumber immediately to have them repaired. Flushing your water heater is recommended once a year to prolong its life and drain the tank of sediment. The spring is a great time to have this flush performed. Also, check the temperature gauge on your heater and reset it to 120 degrees if you turned it up for the winter. For many, spring means the return of gardening and that means having a working hose. Reattach your hose, turn on the water, and check for any leaks in the hose. Leaky hoses can make your water bills go up, so have this problem solved before it’s too late. Spring also means rain, and a lot of it. April showers may bring May flowers, but it can also bring a ton of problems if your sump pump isn’t in good working order. Have your sump pump tested and get any repairs or reinforcements complete before the first spring shower. This entry was posted on Wednesday, March 8th, 2017 at 8:02 pm. Both comments and pings are currently closed.